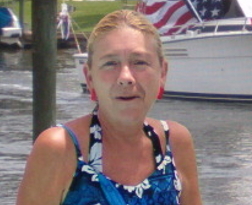 Darcel Lutz Clancey, 66, passed away February 10, 2019 at home after a long battle with multiple sclerosis, with her husband and caregiver Mark Clancey by her side. Darcie is also survived by her brother, Brad Lutz/wife Stacy, sister Patti Rhodes/husband Austin, son Jason Lutz, grandsons Alexander and Nicholas, nephews Clayton Lutz and Landon Rhodes, niece Calista Rhodes and many loving grandnieces, grandnephews and in-laws. Raised in Carlisle/Boiling Springs, PA, Darcie's dream was to return to the Space Coast and live in Cocoa Beach, FL, where she and Mark have resided since 2006, and where they were members of Club Zion Church. Darcie's loving heart, sincere smile, quick wit and compassion will be missed by all who knew her. In memory, donations can be made to Hospice of Saint Francis, Inc., 1250-B Grumman Place, Titusville, Florida 32780.